I brought my dough over to Linda’s house yesterday because I thought we might want something more to play with! We rolled out the dough and placed it in a tart shell. 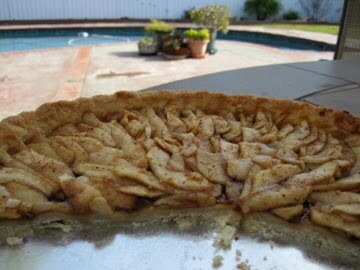 We spread the shell with a layer of wild plum jam and then we layered apples from her apple tree in concentric circles around the tart, but first we tossed the apples with a bit of sugar, lemon juice, and cinnamon. 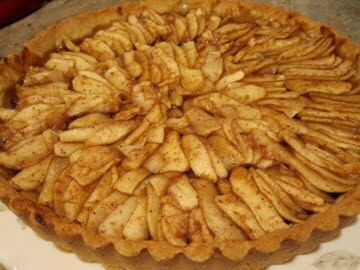 We made sure not to add too much sugar because we liked the balance of the sweet crust with a nice tart apple. 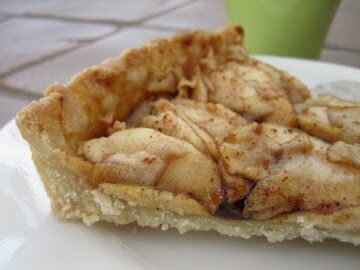 To top it all off, we sprinkled some raw (turbinado or demerara) sugar over the tart. 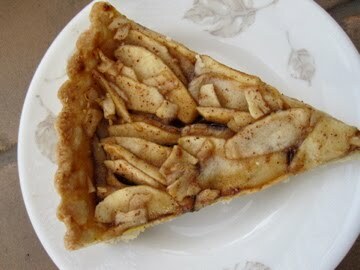 This gave the tart a nice little crunch of sweetness! 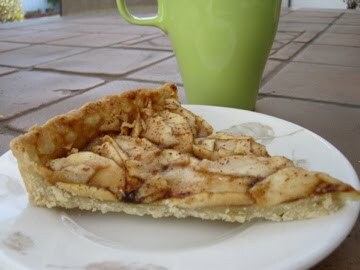 I think this may be one of the best apple tarts that I have EVER tasted. Seriously. Not too sweet, but just sweet enough. The crust is perfect. And the apples are so thin and pack a punch full of flavor! Oh, and I absolutely love the combo of the wild plum jam with the apples. Mmm mmm mmm! Now, laying your tart dough in the pan can be pretty tricky. My goal is to do it like snow white. Even after doing it over and over at work, I still have trouble. Your dough may break here and there, but the dough is pretty malleable and you can just patch things up where you need. Mix well, stirring and folding, until there are no dry patches. Chill at least 4 hours or overnight until firm (you could probably just chill for 1 hour and be fine). Or, freeze. Just be sure to defrost for a few hours before ready to use. 1. Preheat oven to 350 degrees F. Lightly oil your tart pan. 2. On a lightly floured surface, roll your tart dough into a 12- inch disk. Carefully transfer to the tart pan. 2. Spread with a layer of plum jam. 3. Combine your apples, cinnamon, sugar, and lemon juice. Arrange over the dough in concentric circles. 4. Sprinkle with raw/turbinado sugar. 5. Bake for about 40-50 minutes. If your edges start to brown, cover with foil and continue baking. 6. Cool and take your gorgeous tart out of the pan. Serve warm with ice cream, coffee, or on its own. ← Oh My Gah…Rainbow Cake!!!!!!!!! !